About our Church building, cont’d. The South Chapel - dominated by the Clayton Memorial, is really Early English (c1230) but was much altered in 1460. It was probably dedicated to SS Catherine and Margaret. 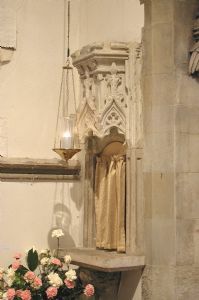 The quatrefoil is thought to represent the site of the cell of Brother Robert, hermit of Bletchingley who received a grant of a bushel of wheat from Henry III in 1233. It has been suggested that he was a Franciscan, one of the earliest in this country. The chapel of the Holy Spirit in the North Aisle was dedicated here in 1952 in memory of members of the Lambert family. The 15th century canopy over the Aumbrey was discovered blocking the lancet window in the South Aisle, put there no doubt, in Reformation Times. The organ by J W Walker was built in 1876. It is a two manual instrument with pedal board comprising thirteen speaking stops. It was re-built in 1973 when more stops were added to the manuals and the pedal board which was replaced with a full thirty-two note compass. The Pulpit was given to the church by Robert Holman of Pendell whose arms appear on it with the date, 1630. He was the son of the builder of Pendell Court. The hour-glass stand is contemporary. 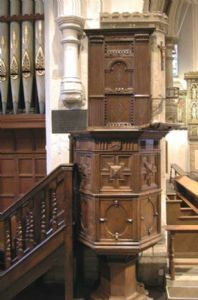 At the restoration in 1870, this fine Jacobean pulpit was thrown out and removed to Orsett in Essex, from where it was recovered in 1937 and put back in its original place. Behind the back of the pulpit (which can be lifted forwards) can be seen the nave altar niche where no doubt stood the figure of Our Lady, as patroness of the church. Some of the original colour remains. The font is Perpendicular c1460. The fine oak cover was carved for it in 1906 by Albert Maynard. The Maynard family is reputed to descend from one of Anne of Cleve's retinue.